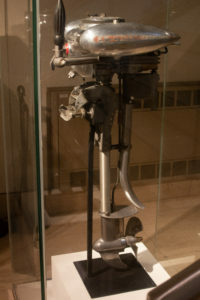 In the section on Modern design, I was delighted to see this Sears “Waterwitch” outboard motor from 1936. 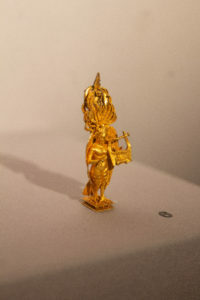 Patty is currently researching connections between deities of the ancient world, so we found ourselves in a number of galleries viewing pottery, statues and small metalwork. 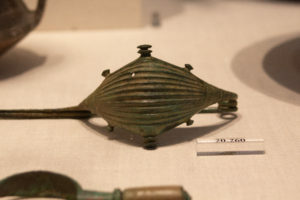 I have to admit that ancient pottery just doesn’t excite me, but give me old bronze or gold metalwork and I’ll spend all day staring at it. Actually I even enjoyed looking at this old outboard motor. I have been enamored with the Etruscans for years. 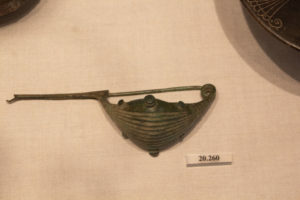 One of the highlights of my semester aboard was a visit to the Etruscan museum in Rome. 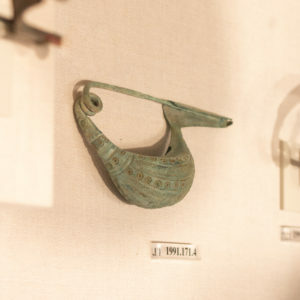 So while Patty drilled down into the imagery on pottery, I moved into the next gallery of Etruscan art where I found two of my favorite things, boats and jewelry. 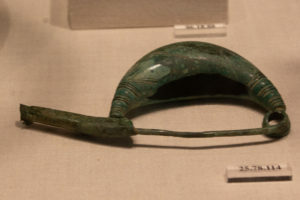 There are plenty of “boat” shaped jewelry pieces in the Met, but little of it comes across as an actual depiction of a water vessel, but more a general description of a “boat shape”. The fibula is the ancient form of what we now call a safety pin. 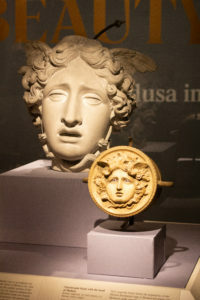 The fibulas at the Met are varied in size as well as material and there are a few in nearly every gallery of ancient art. Although I’ve been aware of its significance in the jewelry timeline, I have never found myself seeking them out for study. 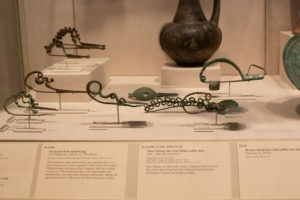 That is, until I saw the “navicella” style fibulas in the Met’s Etruscan room. My best description would be to imagine the bow and stern of a ship becoming elongated to the point as to come around to hook onto itself. According to the gallery label, this style was worn almost exclusively by women. 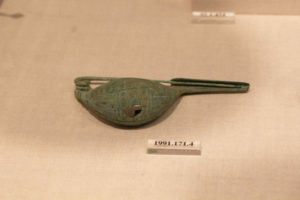 As an artist, we can take these forms of vessels and redesign them to become wearable. 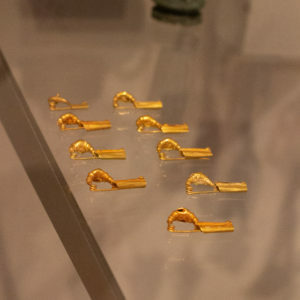 I was delighted to see that I’m not the first jeweler to visualize in this way.